Was 2014 Hot Enough for You? Welcome to the future, here today. 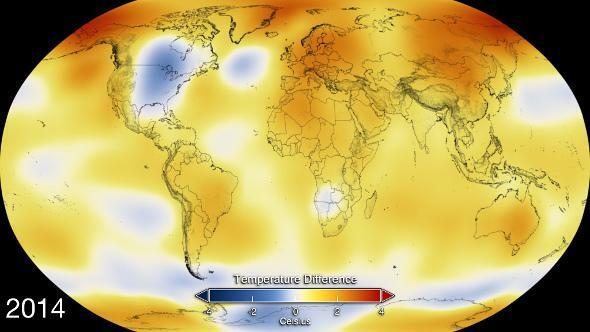 So, it’s official: 2014 was the hottest year on record. The National Oceanic and Atmospheric Administration and the Japan Meteorological Agency both rank it that way while NASA puts it in a statistical tie with 2005 and 2010. I’m not a huge fan of “hottest year” type statistics, as I’ll get to in a moment, but this one is important for two reasons: One is that there was no El Niño last year, which tends to drive global temperatures up. (Many record years were ones that had El Niños.) 2014 broke the record without any help. The other is that, according to the NOAA and JMA, 2014 was statistically significant. Let’s say you flip a coin 10 times, and it comes up heads six times. Is that significant? No, it’s very likely just a random fluctuation, because if you flip a coin 10 times you expect pretty big deviations from a 50/50 distribution of heads and tails. If you flip it a million times and get 600,000 heads, then you’re talking significant. 2014 was like that. Sometimes a year isn’t a whole lot hotter than some previous year and may not be statistically significant. But 2014 was hottest by enough of a margin to make the claim. Even then, I cast something of a skeptical eye when an individual record is broken. Maybe something else happened that was odd, unusual, pushing the temperatures that particular year to new heights. Maybe the next year, things will “regress to the mean,” head back down toward average. So that’s when you bring in the most important issue here: context. History. Trends. 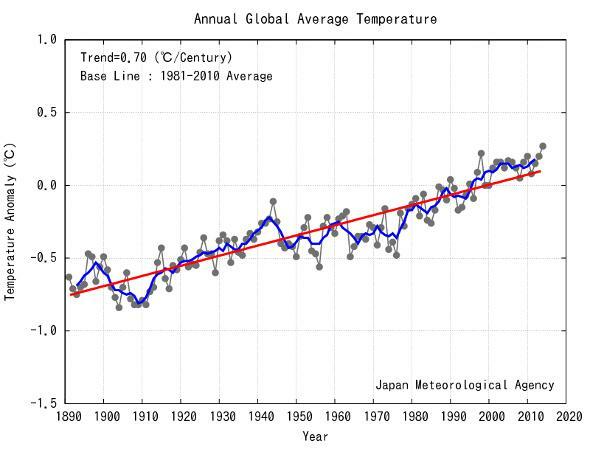 2014 may be the hottest year on record … but of the 10 warmest years on record, nine of them happened since 2000. That’s the important issue here: Not that any one year is the hottest, but that they’re all clustered in the past few years. Goin’ up. The gray line is deviation from the average surface temperature (the average is taken from 1981–2010), blue is a five-year running mean, and red the linear trend over the whole period. It’s getting hotter. This brief animation shows it very, very well. No one record is that exceptional, but they happen more and more now than they did a century (or even a few decades) ago. Few records for hottest year happened in the early 1900s, but now every year has a decent shot at it. So much for the “pause.” As we’ve seen over and over again. If you’re claiming that temperatures haven’t gone up in the past 16 years, you’re looking more silly every year. Of course, deniers gonna deny, but, like cooler years, they’re increasingly becoming something of the past.